Where are all the permit holders? The numbers may surprise you. 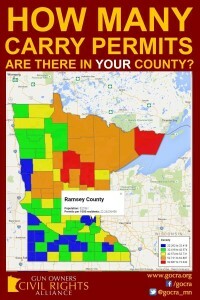 A fairly good piece of reporting on carry permits in Minnesota and around the country. Kudos to reporter David Chanen for using the correct term, “carry permit,” not “conceal carry” or “concealed carry.” Unfortunately, the graphics department didn’t get the memo. UPDATE: As of December 1, 2015, there are 210,647 valid Minnesota carry permits. 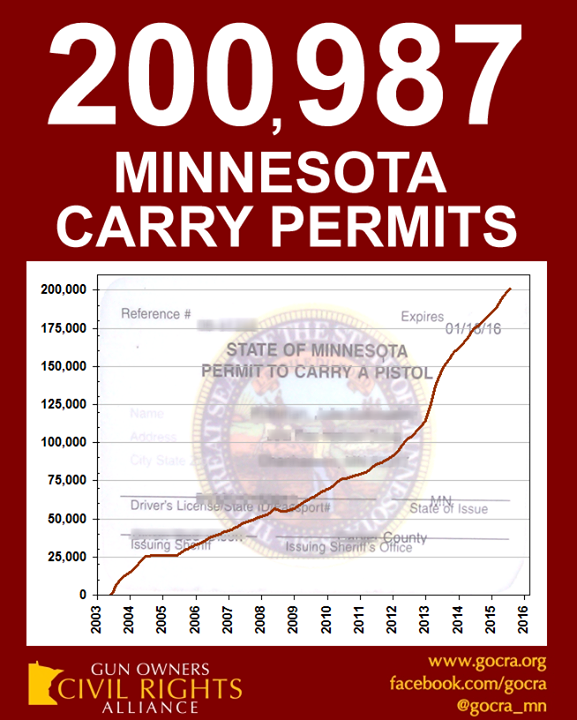 August 20, 2015 – SAINT PAUL, MINN. – For the first time ever, the number of active Minnesota carry permits topped 200,000, according to figures released by the Minnesota Department of Public Safety. As of August 1, there were 200,987 permits to carry a pistol in a public place — more than one in every 20 eligible adults — issued to Minnesotans and those who visit the state. 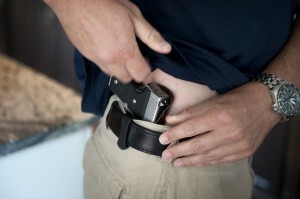 Since the passage of the Minnesota Citizens Personal Protection Act of 2003, permits to carry (openly or concealed) a firearm have been available to any adult 21 and over who successfully completes training and passes multiple criminal, mental health, and substance abuse background checks. Prior to that law, permits were issued at the discretion of law enforcement, and numbered about 12,000 statewide. The numbers, from the BCA’s monthly “Permit To Carry Valid Permits Report” and “Permit Demographics Report,” also show that permit holders, over time, are slightly younger, and that many more permit holders are women. In 2010, less than 12% of permit holders were women. Today, women hold 19% of valid permits. In 2010, only 30.4% of permit holders were 50 or younger. Today, that number is 35.4%.